Here's a bunch of Halloween craft ideas that I love to make. Halloween is a spooky time of year that is so fun and enchanting for children and adults alike! It is one of my favorite holidays of the year since the decorating possibilites are nearly endless. There are some fun craft projects for Halloween listed here. Some projects are perfect for decorating your home for the trick-or-treaters, while others are great projects for the kids to do. If you are hosting a children's Halloween party I hope you will find some craft ideas here to do with the kiddos! The fabric stiffened ghost was a craft I did with my Girl Scout troop many, many years ago. I still have such fond memories of making it as a child and my family kept the decoration for many years. The ghost really comes out neat, I remember always flipping it over and sticking my hand inside its hollow body. My two favorite crafts for older teens or adults are the paper mache projects, including the pumpkins and the spider nest. They take a few days to dry but they are worth it. It is pretty cool being able to make something just out of old newspaper and glue! Recently I added the gourd crafting article to the site, which is really comprehensive. It covers everything from drying gourds, cleaning them out and sanding them, and finishing them for a project. Searches online will show you endless possibilities to make with gourds, including the infamous bird house. Keep this in mind if you go shopping at any farmers markets or pumpkind patches, and think about picking up a gourd. By next year you will have a dried out gourd to craft with. I also have many other pages related to Halloween. Be sure to check out the collection of homemade Halloween costumes. A couple years back I ran a contest for the best costume tutorials, and they are all here for you to view. My pumpkin carving article tells you everything you need to know about cleaning out a pumpkin, baking the seeds, and how to carve a face into a pumpkin from a photograph! Have fun! If you are planning a Halloween party, I have an entire page dedicated to Halloween party planning, Halloween decorating, Halloween party invitations, and Kids Halloween games. Take some time to browse around! 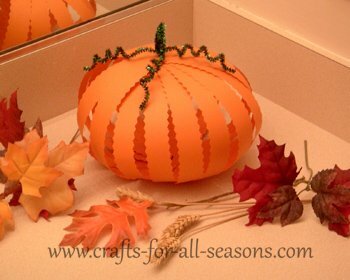 Do YOU have any Fall crafts you would like to share? It can become its own page on this website. Click here! Click Here to Submit a Halloween Craft Idea of Your Own! If you would like to see more Halloween crafts have picked by me, please visit by page on Pinterest.